Welcome to Radiant Heart's Experiencing Angels Page. We have Seminars, Guided Meditation Journeys, and even Private Sessions to empower your interactions with Angels. If you would like to experience angels more powerfully, we can help. If something calls to you as read the desciptions below, follow your intuition. Would you like to experience communication with an angel? Would you like to develop a personal relationship with your own guardian angel? 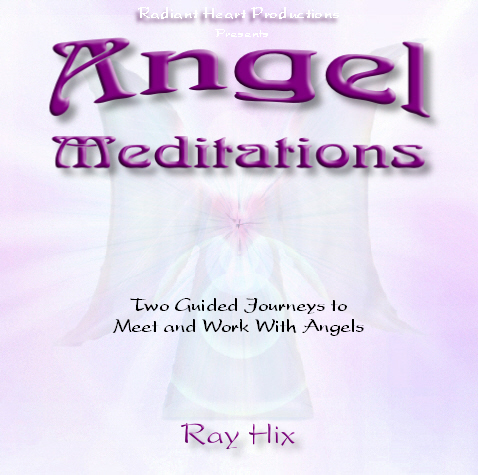 With these guided journeys, you're not limited to reading about angels, you can experience them for yourself. You can use these journeys to communicate with angels, establish a relationship with an angel, and receive love, blessings, guidance and support from angels. The background music is by Aeola. If you have experienced an angel before, and would like to connect more deeply with your angel guide, I can set an energy space to strengthen your connection. I work in partnership with your soul and your angel to powerfully bring through their gifts for you. Or Phone Ray at (510) 525-7470. For more info, see my Private Sessions Page. In this event, we will set a space for you and your friends to directly experience angel energy, meet an angel sponsor, and open communication if you like. The energies we bring through for this angel event are incredible! This is one of our most popular events. You are welcome to bring your friends. Due to limited seating, let me know if you're interested, so I know how many to expect.